I want to thank Harlequin Teen for sending me a copy of this book to read and give an honest review. Receiving this book for free has in no way influenced or changed my opinion or review. **SPOILER ALERT** If you have not read the first book in this series, Waterfell, stop here! There may be spoilers associated with that book. You have been warned! 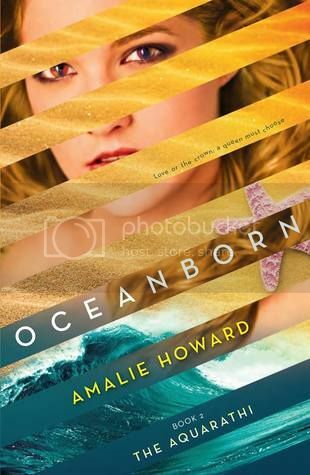 I have to start this review with letting you know that I'm a huge Amalie Howard fan. So, given a chance to read something she writes, you can bet I jump on it. When Waterfell was being published, I jumped on the opportunity to read and review it. And I was not disappointed in any way! I was expected a typical mermaid story, to be honest. I guess I didn't read the blurb closely, or I might not have read it at all considering I'm just a fan or the author in general. What I got was so much more! Not mermaids, but sea monsters, aliens, creatures that can transform themselves so they look like humans and live among our society almost seamlessly. This cover is just amazing. It certainly matches the cover of the first book. What I love most about this cover is the colors and the way they pop off the page. And it's very simple in it's presentation. This book picks up where the first book left off. Nerissa is in Waterfell, but there is much unrest there. And she has sent Lo off to live in the human world, thinking that would keep him safe. But no one is safe, anywhere. There is unrest in Waterfell, but there are people on land who want to hurt Narissa, and they'll do it by hurting those who mean the most to her. Imagine ruling an underwater world from the land. Not an easy feat for the newly crowned ruler of Waterfell who has many against her from the start! I really love Narissa. If you read Seamonster, Speio talk a lot about how selfish Narissa is. But he slowly comes to realize her reasons for why she is this way. And this continues in Ocenborn. I don't find her to be selfish at all, but more selfless. She is willing to sacrifice herself over and over again for those she loves, including Speio, Lo, and her best friend Jenna. I love how she never fears to put herself in harms way to save people. But her duties as ruler and her duties to those she love often don't mesh. Lo, well, you'll find Lo to be a bit different in this book. As the blurb points out he's been poisoned, and he can't remember who Narissa is, despite the fact that they've bonded. And of course, with Lo's memory on the Fritz, others are mover than happy to move in and usurp his time. But he and Narissa still have a connection, and Lo's body can't seem to forget that, which gives great hope throughout the book. Speio, well, I was mad at Speio after Waterfell. I really wanted to just punch him in his head. Then I read this book and he's so much more concerned about Narissa and her safety. He's also back to being a great friend. Narissa has forgiven him for his transgressions. But Speio is still quite naive about things and this turns against him in the long run. As much as he wants to be loyal to Narissa, things don't necessarily always turn out the way they should be. The secondary characters in this book are just as great as the first. I love Jenna. She's the ultimate best friend. She super supportive and keeps Narissa's secret so well. Cara of course makes an appearance again, and I think you'll be surprised at her character development in this one. To say that this story takes a turn your not expecting is an understatement. I truly was not expecting where it went. I loved how Howard kept the flow going and the mystery intact. The pacing is amazing and I flew through the book. The descriptions are so visual I can easily picture them in my mind. Especially when Howard describes the water scenes. All a testament to Amalie's amazing writing. Once again, Rissa's voice drew me and in and didn't let me go. As with the first book, I got sucked into this and could not put it down. I read really wanting to know what would happen. I can say that I can KILL Howard for the small cliffhanger she decided would be the end of this book. And I really need book #3 NOW because how can she expect me to wait to see the conclusion of this series! I'm totally hooked on this world and these characters. I need to see what happens to them and can only hope for a happily ever after for everyone! And, while it's not a mermaid book, I still think fans of such underwater books will completely appreciate this series and need to pick it up! AMALIE HOWARD grew up on a small Caribbean island where she spent most of her childhood with her nose buried in a book or being a tomboy running around barefoot, shimmying up mango trees and dreaming of adventure. 22 countries, surfing with sharks and several tattoos later, she has traded in bungee jumping in China for writing the adventures she imagines instead. She isn’t entirely convinced which takes more guts. She is the author of several young adult novels critically acclaimed by Kirkus, PW and Booklist, including Waterfell, The Almost Girl, and Alpha Goddess, a Spring 2014 Kid’s INDIE NEXT title. Her debut novel, Bloodspell, was an Amazon best seller and a Seventeen Magazine Summer Read. She currently resides in New York with her husband and three children.